Artifacts are misleading or confusing alterations that are introduced into structures, organs or tissues, most commonly due to flaws in technique or equipment. During necropsy changes can be introduced, along with other factors, through improper handling of tissues and organs, the use of incorrect solutions or fixatives or the application of inappropriate killing methods. Some artifacts can look like real injuries and it will depend on the skill and experience of the pathologist to recognise these alterations. A necropsy – when performed properly – should minimise the number of artifacts and therefore contribute to an accurate interpretation during the microscopic examination. A very common type of artifact is tissue damage by improper handling during the necropsy procedure. For example, soft or delicate gill, liver, spleen or kidney fresh tissues can be easily damaged by excessive compression, long exposure to air before fixation, or use of inadequate instruments for sample collection. Depending on the purpose of the sampling, different requirements and risks of spoiling the sample need to be considered. 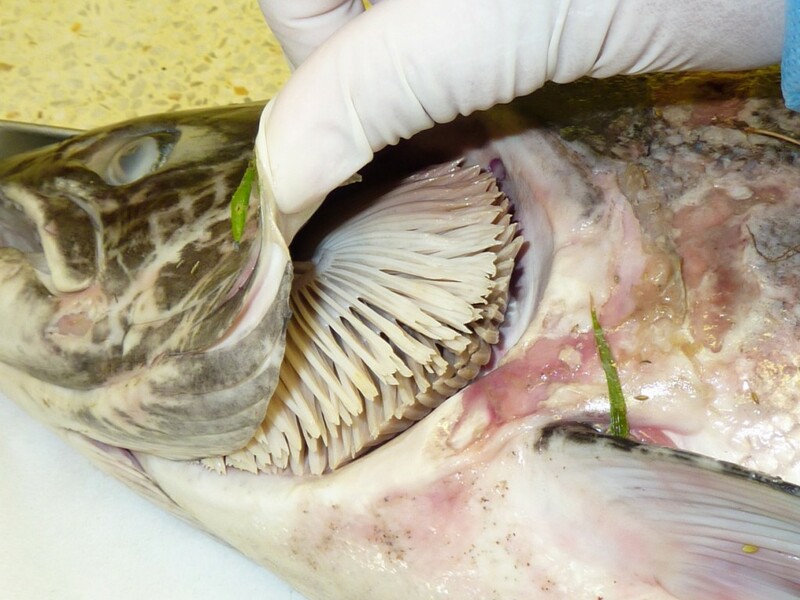 For histological examination it is important to preserve the tissues in the closest as possible condition as they originally were when the fish was alive. A region of interest must not be crushed, torn or punctured, and the use of appropriate tools and holding or grabbing the surrounding tissues rather than the piece to be sampled will prevent mechanical damage before fixation. Samples for microbiological analysis should be protected from contamination. These samples do not normally require to be handled delicately however, the focus is shifted towards preventing the introduction of agents from the environment, other tissues or other samples. Normally this requires using sterilised instruments, and changing or discarding them in between samples to prevent cross contamination. Another factor that can introduce artifacts is producing osmotic imbalance when sampling or preparing tissues for fresh examination. This can be avoided by using appropriate isotonic saline solution instead of water, which will help to maintain the moisture content of fresh tissues, or guarantee the fixatives are correctly buffered, and that all the solutions are used within their expiry date. Additionally, artifacts can appear due to an inadequate proportion of the volume of samples to the volume of fixatives. Finally, the killing method can also introduce undesirable changes. The sacrifice of the fish has to be carried out through euthanasia, therefore it is important to compromise so that the method chosen also considers the purpose for which the animal is being killed. If the required samples are ruined by the killing method it would make no sense even if it was done by euthanasia. As a minimum, the killing method has to be annotated and reported promptly to the pathologist, in order to avoid confusion in the diagnosis. For example, the death caused by a blow to the head causes intracranial and gills haemorrhage and brain trauma. Immediately after death post-mortem changes begin o devlop and will become evident during the macro and microscopic examination. It is important to learn to differentiate these changes from the real ante mortem pathological processes preventing misinterpretation. There is a range of changes that can occur in different tissues and organs and the time elapsed after death is of fundamental importance to their onset. Some tissues undergo changes very rapidly and should be examined or fixed immediately after death. The speed at which changes occur varies with the temperature, the fish health status or cause of death, and some changes can also depend on the amount of fat tissue. An understanding of the post-mortem phenomena allows an estimate of elapsed time since death. A series of changes occur immediately after death and are in general recognised as: rigor mortis, livor mortis, autolysis and putrefaction. Subsequently, alterations are generated, many macroscopically visible and some occurring in a sequential order. The rigor mortis or hardening of the skeletal musculature, is related to the contraction of muscle fibres due a decrease of adenosine triphosphate (ATP) available in the cells. ATP can be re-synthesized from glycogen, thus retarding the rigor mortis in well-fed animals with high content of glycogen in muscle; this explains the quicker development of rigor mortis in poorly nourished animals. The rigor mortis disappears gradually as other phenomena progress. Livor mortis is the gravitational blood settlement. It is more evident in the gills and skin, as a darkening colour. The autolysis or auto digestion occurs by the action of lytic enzymes that are released after cell death. There is wide variation in the content of lytic enzymes among different tissues, resulting in a varying degree of autolysis. For example, tissues such as gill, liver, kidney, and epithelium of the gastrointestinal tract, undergo autolytic changes relatively quickly, while in the muscle tissues this is slower. Putrefaction or fermentation is the decomposition of organic matter produced by the normal bacterial flora present in some organs such as the digestive tract, or those bacteria that invade the body. The post-mortem decomposition (autolysis and putrefaction) involves changes such as bad odour, softening and discoloration, and it favours the proliferation of bacteria in the tissues, particularly the intestine, also inducing bloating. As it progresses this phenomenon decreases the rigor mortis and the softening reaches its maximum level with the liquefaction, a phenomenon that is easily appreciated for example in the brain and kidney. The distension is a type of swelling due mainly to the bacterial fermentation and production of gases in the digestive tract. The accumulation of gas may be so severe that it causes twists, pressing and displacement of adjacent organs or tissues and even breaking part of the tract. Colour changes may vary widely, in fish this is commonly seen on the surface, gills, liver, digestive tract and heart. The breakdown of the blood haemoglobin molecule, coupled with the action of the bacterial hydrogen sulphide, produces shades of blue, green or purple. The lysis of erythrocytes and the dissemination of haemoglobin released into the tissues, causes a generalised redness or paleness of different areas; this is called imbibition or staining by haemoglobin. When the bile is released from the gallbladder into the surrounding tissues they are stained yellow-brownish. Large areas of the liver can become pale as blood is evacuated due to the pressure exerted by the digestive tract distended by the accumulation of gases. These changes are prone to be misinterpreted, for instance, the pale areas in different tissues or organs as areas of necrosis. When tissue samples fixation is required, the interval between death and fixation should be kept to a minimum. This is not always feasible, as in the case of mortality events. Refrigeration can slow and reduce autolysis while freezing is not recommended, especially if histopathology is required, because the ice crystals cause the breakdown of the cell and tissue architecture; however frozen samples can still be useful for certain microbial tests.